We've taken the guesswork out of choosing a quality banner stand. We offer a carefully selected line of banner stands that have been tested to be the best in class. No clunkers, no stands that fall apart at first use! We only carry those banner stands that have passed our stringent evaluation process for quality and durability. NEW! We've expanded our best selling premium Glade Banner Stand line and it's now available in widths ranging from 23" to 57" wide! 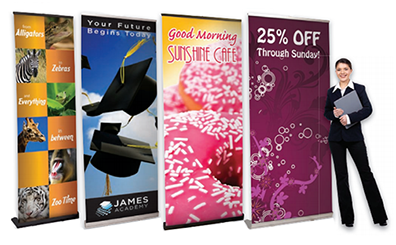 Banner stands with premium graphic start at just $239! This super sleek stand is built to the highest quality standards and will surely become your favorite, too! Or, consider our value leading Mojito Banner stand. Prices start at just $185, with a 31" wide stand for an amazing $198 complete with premium graphic. Need help deciding which banner stand is right? CLICK HERE and we'll help you decide.